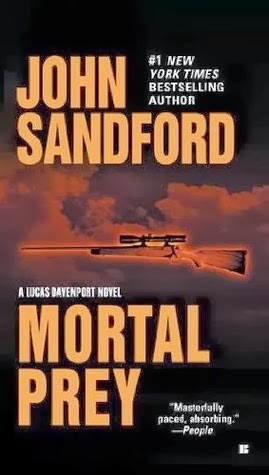 The thirteenth entry in John Sandford's Prey series finds the protagonist, Assistant Minneapolis Police Chief Lucas Davenport, with his life in an uproar. His long-time boss, Chief Rose Marie Roux, is about to lose her job as a new mayor takes over. This means that Lucas will be out of a job as well. But Rose Marie is angling for a state job and, if she can pull off the scheme, she promises to take Davenport with her. On the home front, Lucas's girlfriend, surgeon Weather Karkinnen, is with child. She and Lucas are planning a wedding and, at the same time, Lucas has leveled the house he has lived in for years and is building a new one. Of course, these are three of the most traumatic events that can befall a person, and no sane human being would ever have a kid, plan a wedding and build a house all at the same time. In real life, this combination would probably be the death of even the strongest relationship, but it makes for some entertaining moments in fiction. In the earlier book, Davenport runs the villain to ground but the villain manages a narrow escape. The person leaves the country and plans never to return until old criminal enemies discover the villain living abroad and send in a hired killer. The killer misses his target and kills someone near and dear to the villain who is now an injured party and royally pissed. The IP returns to the U.S. determined to seek revenge. In doing so, the IP turns up on the radar of the F.B.I. and they ask Davenport to join in the hunt, since he knows the villain/IP better than any other law enforcement person. Davenport agrees and a great game of cat and mouse ensues in which the determined IP tracks down targets while Davenport and the Fibbies attempt to intervene and capture the IP. Even though most of the action takes place in St. Louis, Davenport is wise to the ways of the streets and recruits a cast of local and very able-bodied assistants. All in all, it's great fun and one of the better books in the series with all of the wit and dry humor that readers expect from Sandford. But to enjoy it to the fullest, again I would urge any interested reader to read the series in order.